I had to turn around to get a shot of this! Found this gem near the Waipio Valley on the island of Hawaii. 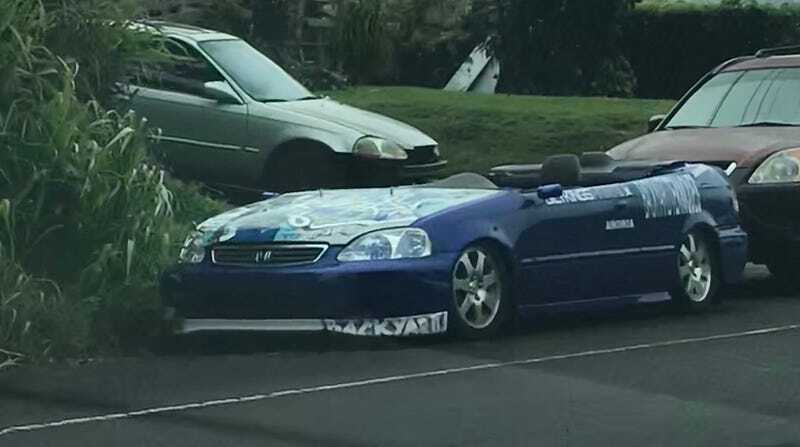 Considering they have vehicle inspections in HI, I’m surprised this was on the street AND appeared to be registered. It sure looks like a death trap but I kinda like it. Not enough to buy or build one. But you know, drive it with a helmet on, blasting some early 2000s techno, and speeding in a residential area. Ahhh, this is what convertible Civic dreams are made of. Until you flip it. Or take a corner. Maybe not in the rain. Who am I kidding? It’s about as useful as a paperweight.